It’s definitely not the most photogenic of meals, or maybe I’m just not good enough to make it look pretty. But it is simple, easy, relatively quick, and very tasty. It’s also something I think is pantry-ready, assuming your pantry is stocked with curry powder and lentils. Your pantry should always be stocked with an onion or two and lots of garlic. 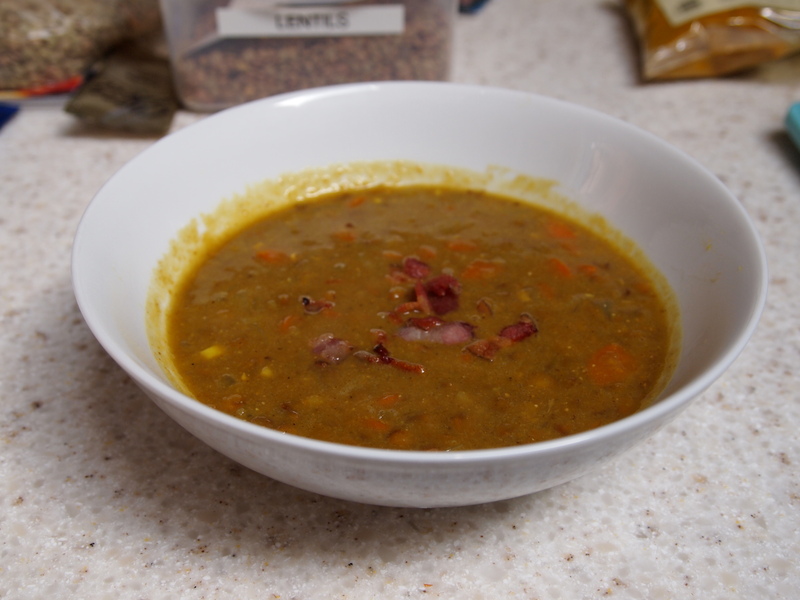 Molly Wizenberg’s (aka Orangette) Curried Lentil Soup has been making its way around the internet, after appearing in Bon Appetit magazine. I happened to have a carrot slowly withering away in the fridge, so I thought I’d whip it up while waiting for the lone carpet guy to install new carpet in the dog room and while Travis played outside breaking concrete with a sledgehammer. Because I remembered my Vindaloo curry powder (from Penzey’s) packs a wallop, I paired it with some sweet curry powder. Even so, the soup has quite a kick to it, at least to me. The pureed chickpeas add heft and thickness to the soup, but it’s not a creamy soup as if you had added cream or half and half. I consider it a pretty healthy soup. Even with the piece of crumbled bacon (bingo bacon!) I put on top. This entry was posted in food, recipes and tagged curried lentil soup, pantry soups. Bookmark the permalink.